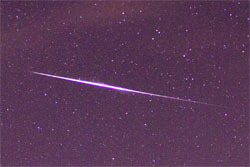 A bright fireball lit up Maryland’s evening skies Tuesday June 6th near 9:58 PM. 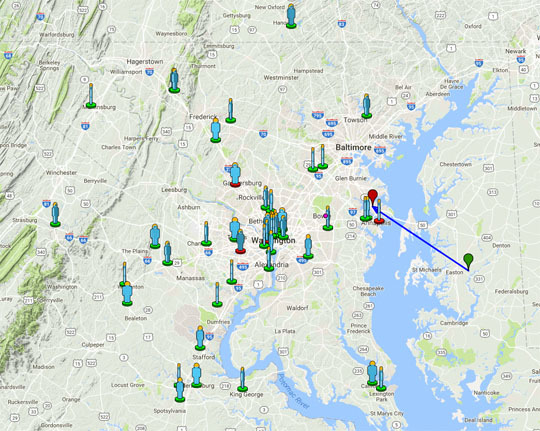 Over 50 eyewitnesses from Maryland, Washington DC, Virginia and Pennsylvania reported the event to the American Meteor Society. Two lucky drivers with dashcams rolling captured the meteor on video. One in Kensington MD and another in Springfield VA near the i95 exit on 495. 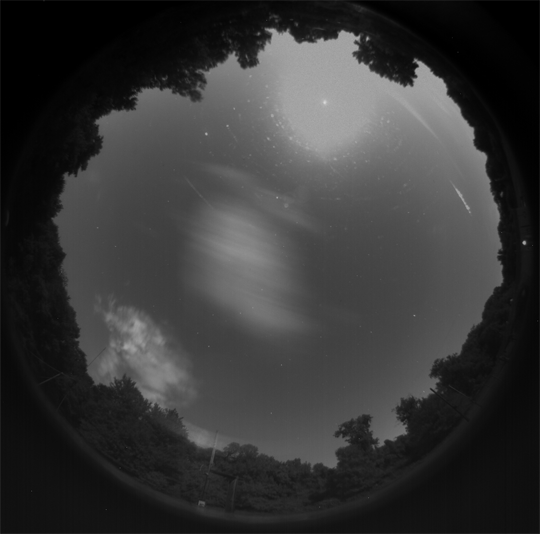 The University of Maryland College Park Astronomy Department also caught the fireball on their All Sky Camera. 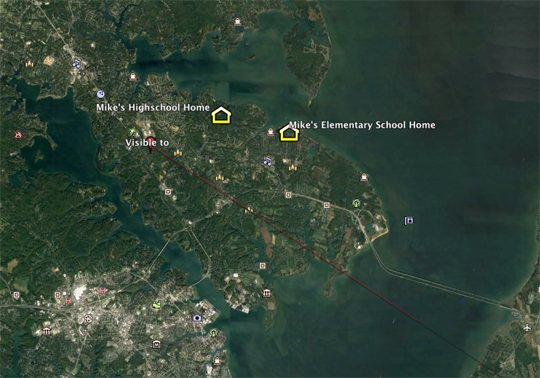 The trajectory of the meteor plotted from the AMS witness reports starts over the Eastern Shore of Maryland near Easton and ends, almost on top of Anne Arundel Community College. This places the meteor’s final flight path directly over the Broadneck Peninsula, which happens to be where I grew up and spent most of my childhood. My personal interest in this event spiked when I realized this. If you know the location the video was taken from, using Google Earth and Google Street View, you can examine the video and determine the azimuth position of the meteor using ground references caught in the images. For the 495 video, I was able to locate the driver’s position on 495, thanks to him capturing the exit numbers after the meteor went out (thanks for that!). I could then line these up on Google Earth to get my angles. Unfortunately these are only estimates and could be off by up to 5 degrees. There are several factors that can effect this, but an important thing to consider in this analysis, is the true start and end of the fireball most likely were too dim to be caught on film. So the actual start and actual end could be a few degrees off from what we first see. 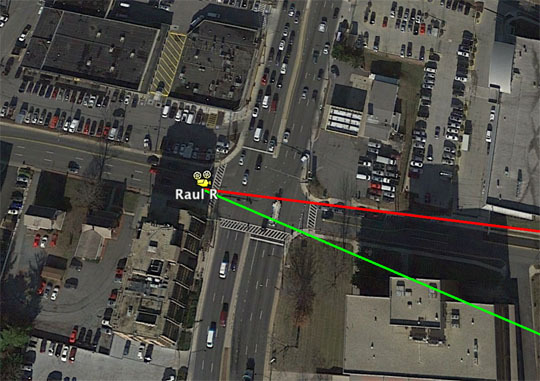 Further, while the Google Earth line-up method does work, it is inherently not perfect. Never the less, any video is better than no video, and all of them provide value in learning where and if a meteorite has fallen. I was able to do the same analysis for the Kensington, MD Video. 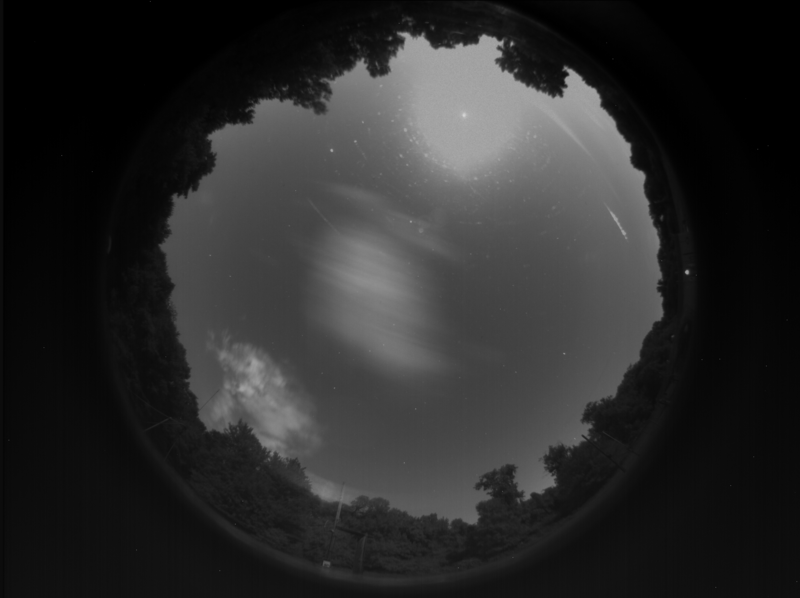 The University of Maryland All Sky Camera picture was much easier to work with because several reference stars were visible. 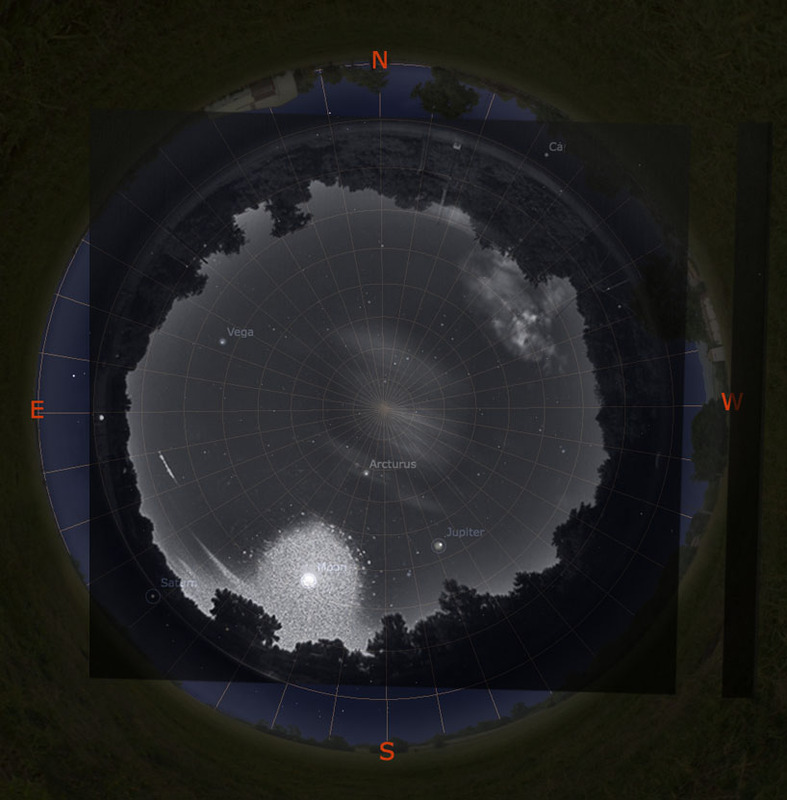 Lining up the image over top of a star chart taken from the location of the observatory and exact time of the fall enables you to ‘solve the picture’ and reduce azimuth and elevation angles. However uncertainty is added to the true start and ending positions due to the light sensitivity of the camera. 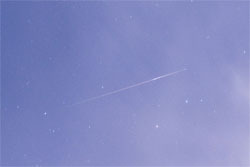 It is likely part of the early and end flight were not captured by the CCD as they were too dim. By drawing out the azimuth lines for the start and end points from each camera’s location, one can figure out visually where the lines intersect. Those places will be the start and end of the meteor’s trajectory respectively. Reducing the azimuth angles from the all sky image and dash cam video corroborates the AMS trajectory while adding a little uncertainty. 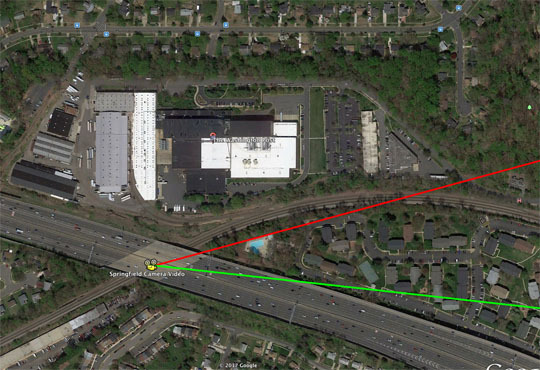 Did the meteor really fly over Broadneck, or was it farther west closer to DC? 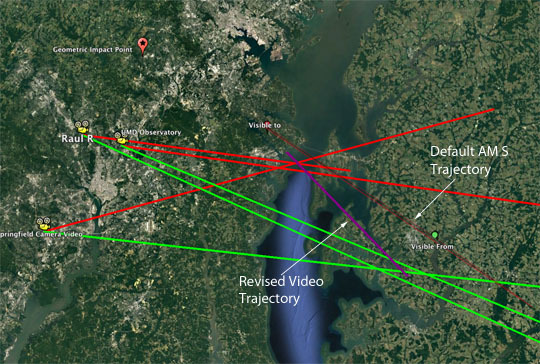 Thankfully, three witnesses located in Annapolis MD all reported seeing the meteor over the Severn River, placing it’s path East of Annapolis. These witnesses are the closest to the track on the western side, constraining its location nicely. Unfortunately, there were no reports east of the Bay, so there is more uncertainty there. 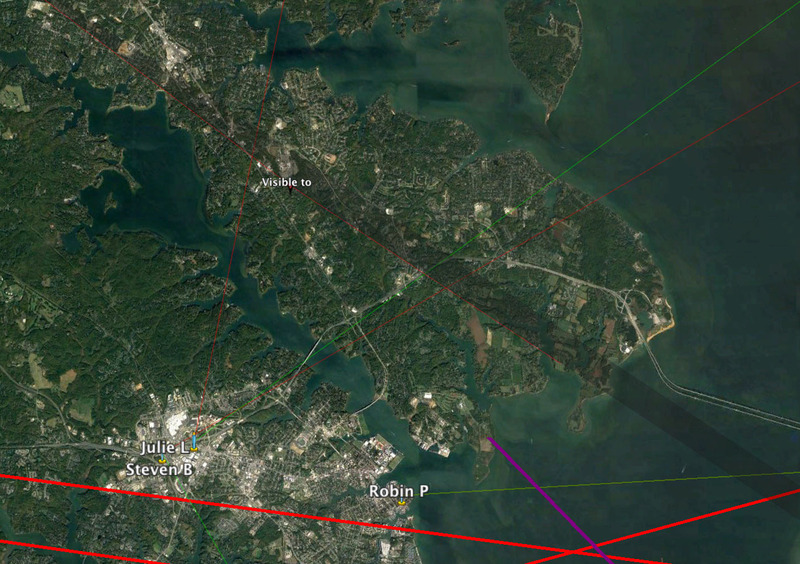 Three critical witnesses in Annapolis all report seeing the meteor across the Severn river. Solving a fireball’s trajectory from witness reports is not an exact science. People’s minds and eyes are faulty and they can’t always report accurately exactly what they saw. Some are better than others, and some are completely wrong. For these reasons the AMS uses an averaging algorithm and standard deviation formula to attempt to find the best fit for the fireball’s path. This solution can be improved further, by running it a second time and deleting any witness report that is not within 10 degrees of the 1st averaged points (for start and end). If there are enough witnesses this technique can prove to be significantly more reliable than the initial average. This enhanced algorithm is not computed automatically for all AMS events, but for select events it can be run manually. I was pleased to see the output of the enhanced trajectory agreed almost exactly with the video trajectory and also improved on the original average. 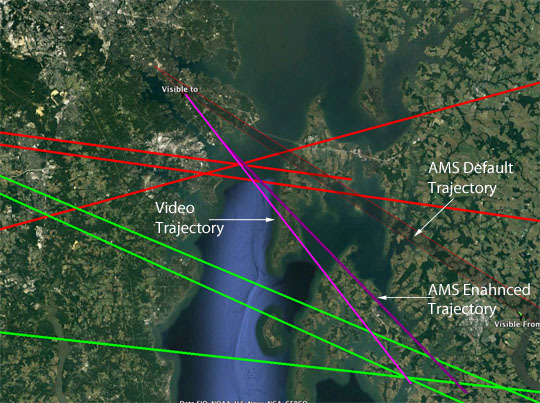 This means we have three different trajectory solutions with two different sets of data and all agree within a small margin of error that the meteor flew over the south west side of the Broadneck Peninsula. Considering jet stream winds blow mostly west to east in this part of the world, that would place meteorites, if they fell, all over Broadneck up to and into the Magothy River. Now this meteor wasn’t the biggest, or the brightest meteor ever reported by a long shot and there were no reports of sonic booms (something that usually accompanies a meteorite fall). While magnificent to everyone who saw it, in the grand scheme of things, this was your average everyday kind of fireball. 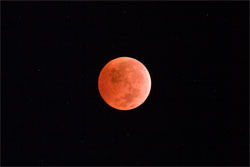 Reportedly not quite as bright as the full moon, if one had to guess its size, a safe bet would be smaller than a basketball before entry into the atmosphere. Now on the positive side, the fragmentation from this event is evident in both the dashcam video and the all sky picture. Each light burst or fragmentation event is evidence of the underlying object breaking apart. These bursts turn the single big rock into dozens, hundreds or even thousands of smaller ones. This is how meteorite strewnfields are created and generally speaking the more fragmentation events the more meteorites there will be.We can see 6-7 bursts in the UMD photograph. 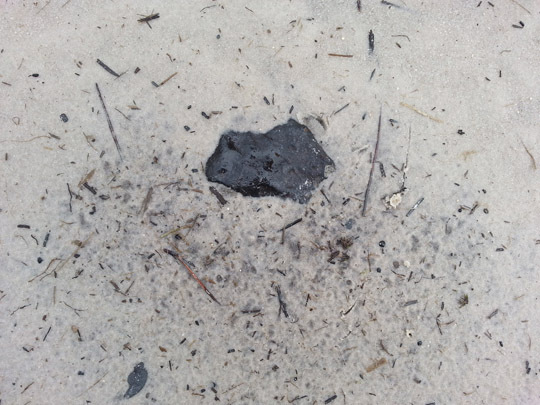 Did meteorites really make it to the ground somewhere in Arnold? Unfortunately, there is rarely certainty when it comes to meteorite falls, and the only way to know for sure is to go out and look. Now any meteor that is well documented and large enough to drop meteorites will peak my interest, especially those on the east coast or within a few hours drive of my home. But one that potentially landed right where I grew up, yes that’s got my attention. Is it a slam dunk? Certainly not. 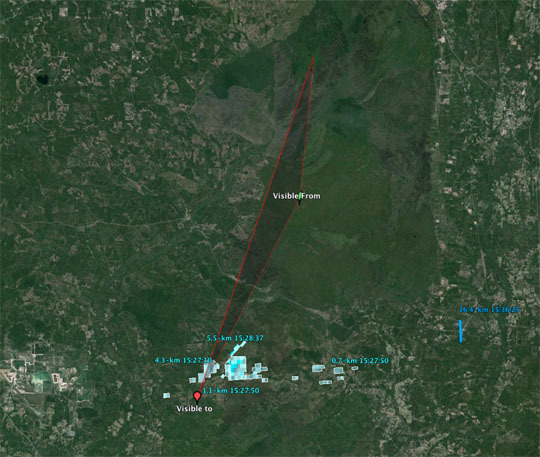 No significant evidence of a meteor fall was found on the NEXRAD Doppler Radar. While the lack of radar does not mean meteorites didn’t make it to the ground, having radar greatly increases the certainty they did. The radar also tells you exactly where to look. So hunting for a meteorite without Doppler, some would say is a fool’s errand. I don’t necessarily agree with this and believe it is more of a personal choice. 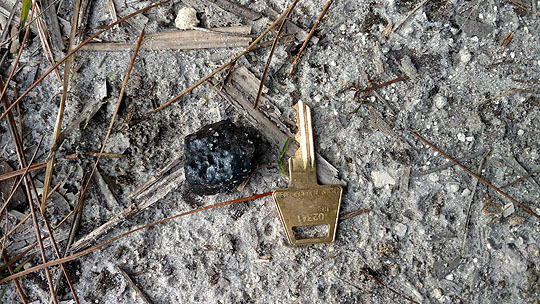 Should you quit your job and spend everyday looking for the Magothy meteorites? Probably not. 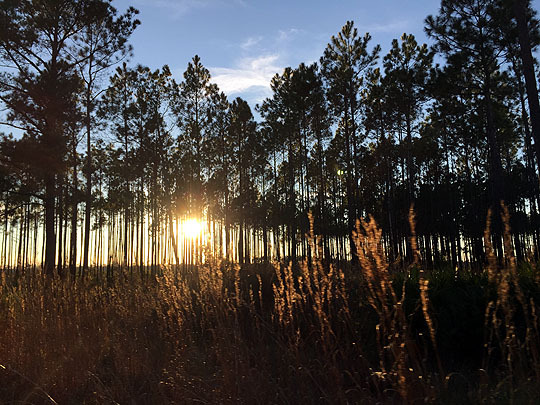 Is it worth keeping an eye out while you work in your yard, walk your dog or go for a jog? Absolutely. The more people who are aware and the more people who are looking, the greater the chances that someone will make a find, if there is one to be had. 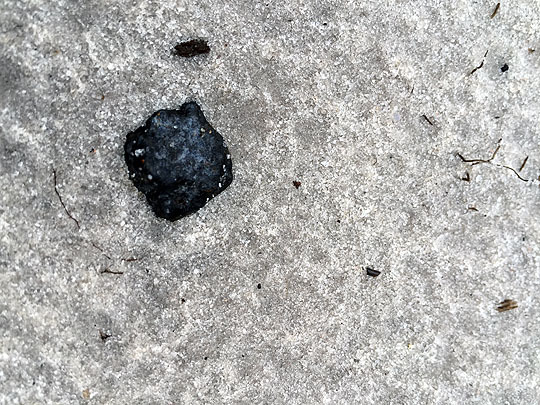 So if you live in the Arnold area, especially in or near Cape St. Clare, anywhere along College Parkway or really the north side of Route 50, please be aware — there could be meteorites in your yard, driveway, street, or local parks and beaches. Is it worth looking for them? 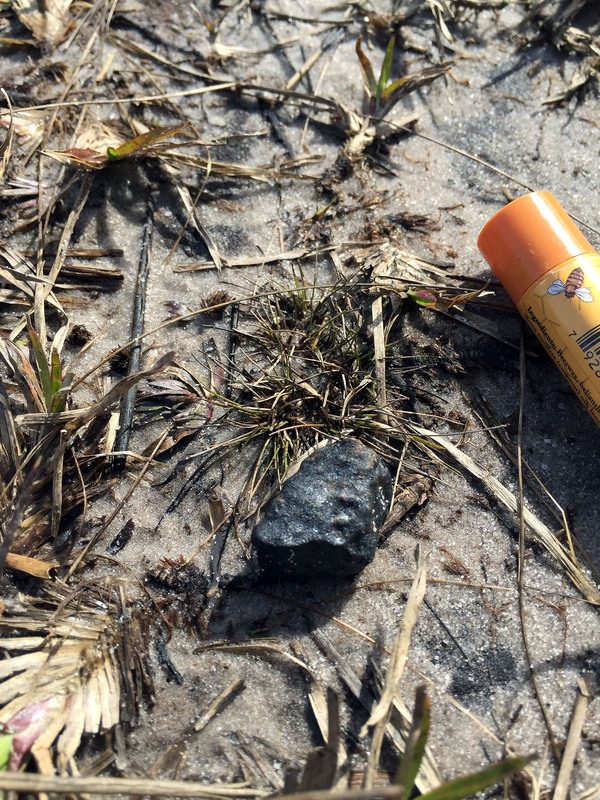 Considering only 4 meteorites have ever been found in the state of Maryland, and the last one was found in 1919, the simple answer is : YES. 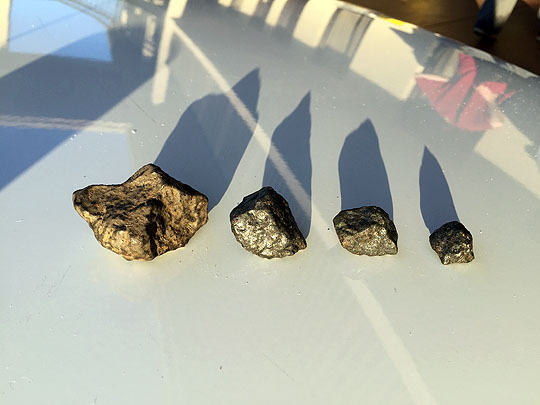 It is worth looking for meteorites from a new fall in Maryland, especially if there is a possibility of meteorites falling and a search area that is fairly well constrained. 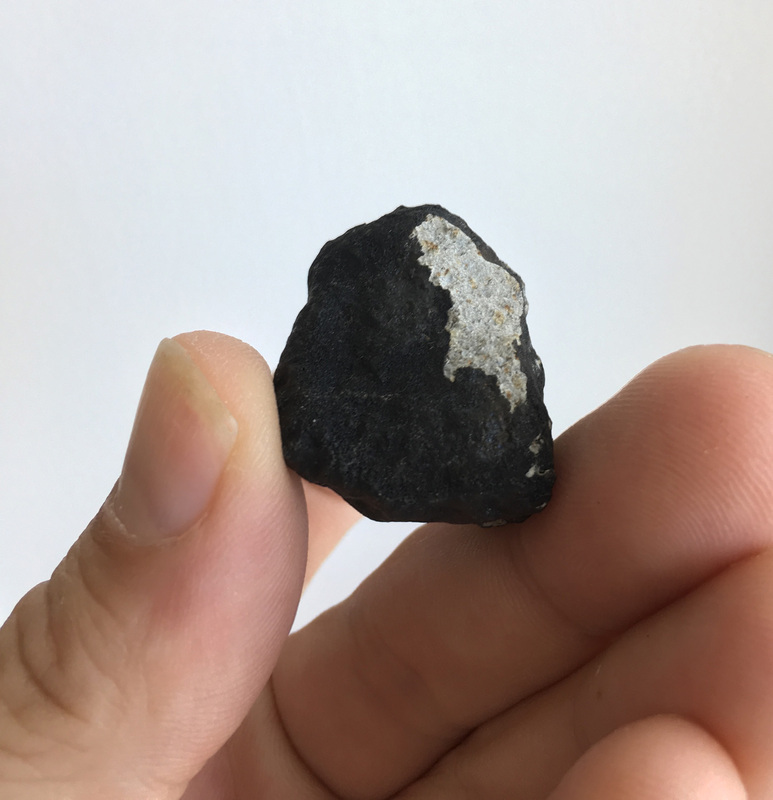 A meteorite found in Arnold would be the first meteorite found in Maryland in almost 100 years and would certainly be worth its weight in gold. More importantly freshly fallen meteorites possess scientific value that can lead to new discoveries about our solar system and how it evolved. Meteorites are black and shiny when newly fallen. They will have a thin black skin around them called a fusion crust. It may cover the entire stone, or part of it. Closely examining the crust can reveal flow lines and other signs of the melted material being blown off the rock as it traversed the atmosphere. Meteorites will be heavy for their size and attract a magnet. Meteorites will not have holes, or pox marks in them. There are many man made rocks called slag, that people mistakenly think are meteorites. Slag is easy to identify once you understand what it is and what it looks like. Slag is what is left over from melting rocks for metal refinement, so it looks burnt and melted and it is also usually black. Slag almost always has little holes or air bubbles that solidified in the rock as it cooled. Meteorites won’t have holes in them. 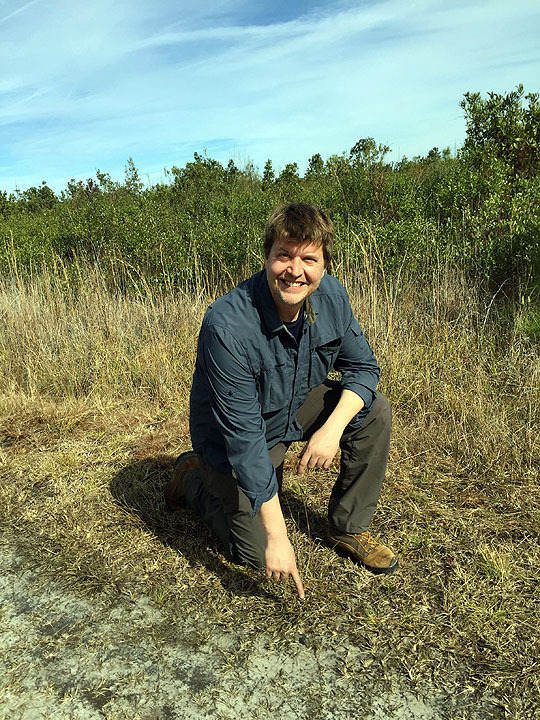 On Sunday January 24th, 2016 at 10:30 AM, a bright fireball streaked over the Florida skies. Having been a bit worn down from the east coast snow storm, I got excited when I heard the news from my friend Marc Fries. His message was short and sweet, “Your pending AMS reports contain a meteorite fall!” I immediately checked and approved over 80 reports from eye witnesses of the fall. After computing and publishing the trajectory, I sent the map to Marc. He responded quickly, ‘SPOT-ON BULLSEYE!’ The AMS’s fireball trajectory intersected with the meteorite cloud Marc had found. While fireballs fall every day, it is rare for large groups of people to see them. It is rarer still for them to show up on doppler weather radar. When this does happen, its an almost certain sign that meteorites are on the ground under the return. This was one of those times. A radar return like this takes out all the guess work and you know exactly where to search. News of the fall spread in the meteorite community quickly. I got a call from my friend Larry Atkins the next day. He exclaimed after I answered the phone, “I’m in the car, just two hours away from the strewnfield!” Larry had been visiting his Dad in Florida the weekend of the fall. When he heard the news, he jumped in his car and and started driving toward the field. While the radar returns looked rich, the terrain and prospects for making a find were bleak. The meteorites fell over swamp land and pine forests. Hunting for meteorites in the woods is doable but not easy, hunting in a swamp is beyond possible. Larry spent the next few days driving around the area and getting a lay of the land. He figured out who the land owners were, contacted them and hunted what he could, even in the rain. We talked daily and by Wednesday I was ready to roll. 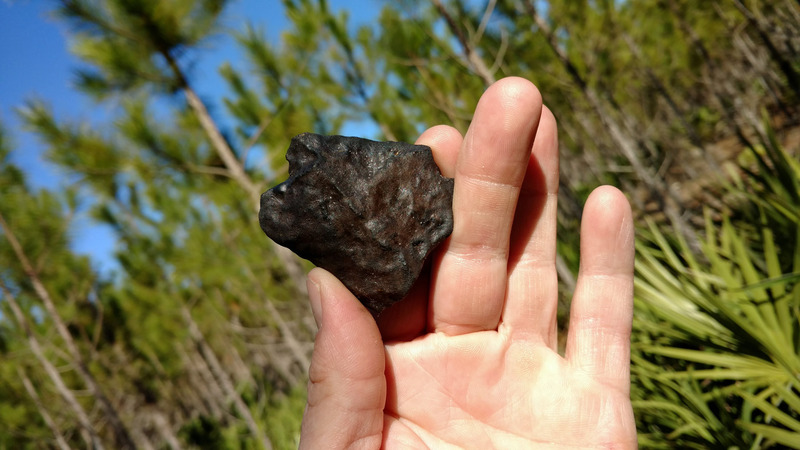 I hadn’t been meteorite hunting since 2012 and I was ready to try my luck again. 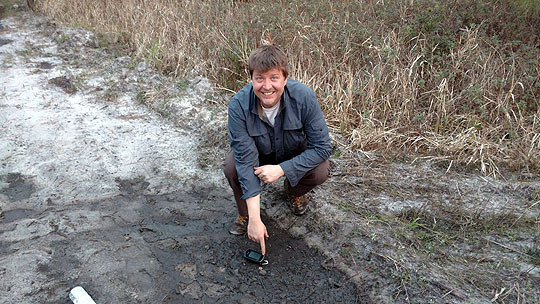 Besides, with the cold and snow, I could use a long weekend in Florida, even if it was walking around a swamp. I drove down with my friend Brendan Fallon Thursday night. We were in the field hunting with Larry and his Aunt Laura by Friday morning. I’m glad Larry had done all the ground work before I got there, or else I’d have been driving around lost for days. As we approached the ground near the radar returns, Larry got a call from a local number. We stopped the car. It was a land owner. After about 15 minutes of talking we left to meet him at his property. When we got there, he told us, the morning of the fall he heard a crackling noise and saw two smoke rings in the sky above his head, one inside the other. He was into the fall and liked the idea of finding a meteorite from it, but at the same time, he didn’t think we had a chance. He gave us permission to hunt, a key to the gates and a laminated map of his 15,000 acre ranch and then went on his way. Larry responded, “I’m glad you appreciate my last 4 days of hard work Mike!” We all laughed, as we trotted into the property. This was the zone, and we all knew we were going to find meteorites. It’s a super exciting feeling you get when you are walking around in a place where meteorites just fell. Every step and every glance matters, one step leads to the next and there could be a meteorite around you at any time. We spent most of the first day at the ranch and left in the afternoon to scout out alternate areas. There is only one road into and through the search area, and calling it a road is a bit of a stretch. It’s made out of what looks like beach sand and is even called Sand Hill Road. It had rained all day the day before, leaving the road and many areas flooded. Larry was riding shot gun when we got to a wash out that was wider than the road and over 50 feet long. Surrounded by deep mud, it looked like a lake. I stopped the car saying, “I don’t think we can make it through.” Larry encouraged me stating confidently, “We definitely can.” After some back and forth, I switched seats and let Larry drive. He backed up and then accelerated fast. 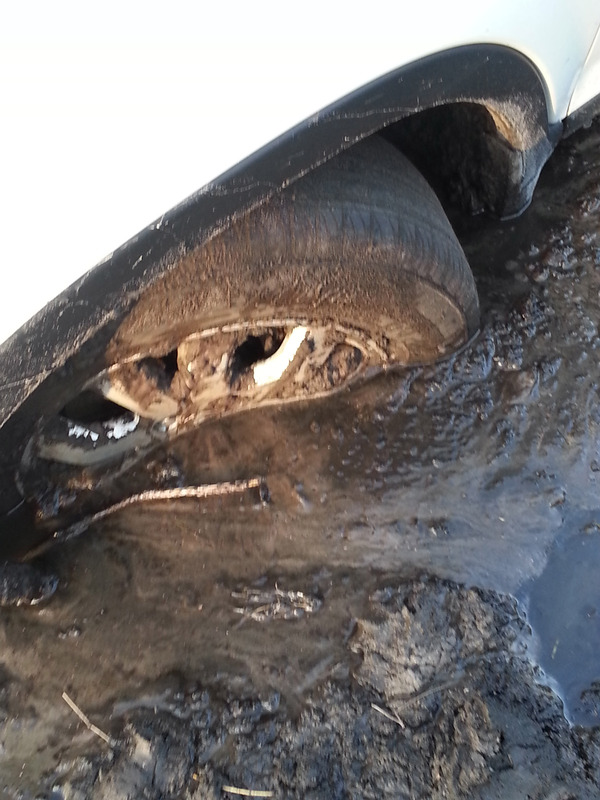 We hit the pond at 30 MPH and drove right through it, with quite a bit of mud squirming. Astonished and relieved, I gasped, “nice job!” Part of me thought we were going to get stuck. I don’t think I would have attempted it alone. Needless to say, I was really impressed with Larry’s driving that day. 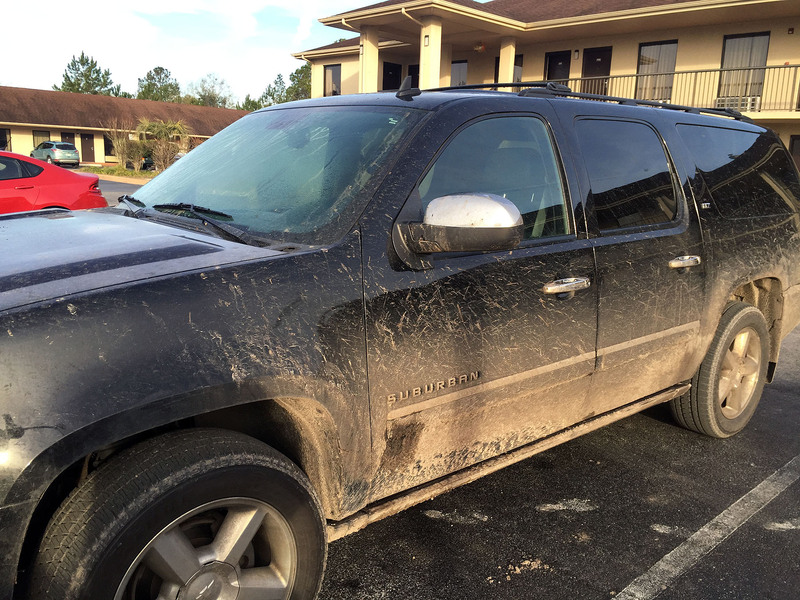 My car after one day in the field. We spent the rest of the afternoon scouting for ‘low hanging fruit’. Thats what we call clear spots along the side of the road or hunt-able areas that are easy to access. Exhausted, we left he strewnfield and went straight to dinner. We celebrated at a nice steak house like we had already found meteorites. We were all filled with energy and so optimistic and grateful to be at that place in that moment. The next day, we went out to the state park and started hunting the paths and dirt roads that went through the swamp. We were all walking north on a road about 10 feet wide. We got to a fork and Larry and Brendan turned around to search the other side of the road. Laura and I stayed behind to search the remaining roads. We didn’t get far as the water from the swamp overflowed onto the road making it impassible. We turned around and headed back to the car to regroup. On our walk back, I paused for a second to stretch, looked down and there it was. 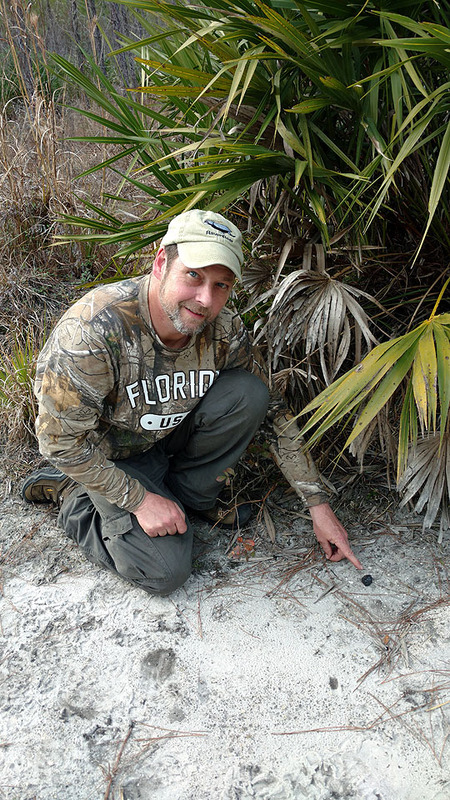 The first meteorite from the fall. It was small, about 8 grams and I knew right away, but was cautious to get too excited at first. I got on the ground with my face just inches from the rock. Examining it from all sides I stated, “this is a meteorite.” Laura excitedly inspected and agreed. After a quick meteorite dance, Laura ran down the path to get the other guys while I stayed behind. They returned, we celebrated, took some pictures and continued on. I felt so relieved and at peace. Any other finds from this trip would be a bonus. I’d accomplished what I’d set out to do and was totally satisfied. We had a meteorite from this fall. I thought about all the mechanics involved to get to this place and time. For over 4 billion years this rock traveled 100s of millions of miles. Just 6 days ago, it ended its journey in a brilliant explosion 10-20 miles above the Earth’s surface. And then, was found by me in a swamp. It was an amazing thought cycle filling me with euphoria. I hunted around the next two hours close to my find. I wanted to find the fragments related to it. Meteorites often fall in clusters and are found close to each other. Surrounded by water and a swampy mess, I couldn’t grid the area, so I just did the best I could. A little later, I heard screaming from the group. Sure enough, Larry had just found the second stone. 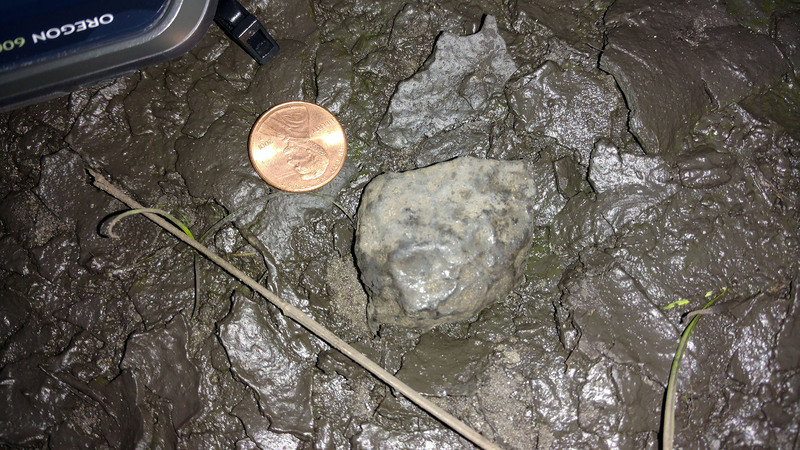 A 18.5 gram stone about a half-mile south of where I found mine. We all celebrated and were so excited. Now that we had found two stones and just hours apart, we all knew there were more meteorites all around us. We hunted until dark that night and then went out to dinner to celebrate. We were all walking on air. My friend Josh Adkins drove down from Baltimore Saturday night and arrived in Lake City before we headed out to the field. Having not slept, and just driven 13 hours, he was pumped and ready to spend the day hunting. It’s amazing the energy people can get from meteorites. We went back to the place where we had made the finds. “You don’t run from meteorites.”, Larry repeated a few times that day. When you find one meteorite there are others close by, so stay in that place and keep searching. Larry, his Aunt Laura and I started near my find. 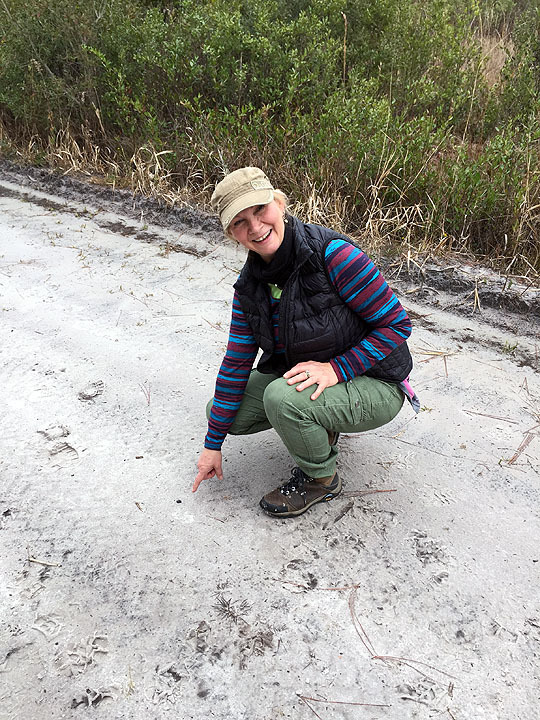 We were walking down a sand road just about an hour after we started, when Laura exclaimed, “Here’s one.” Sure enough, one side of a small meteorite was poking through the sand in the road. I don’t know how Laura even spotted it, as it was flat against the road and looked like a leaf. After taking some pictures she pulled it out of the dirt. It left an impression the size of a sugar cube in the sand road. After Laura’s find, I started paying extra attention to all the dark objects on the ground. Leaves, burnt wood chips and tree bark all look like meteorites from 6 feet up. The only way to know for sure is to touch them as you go by. I spent the rest of the day, crouching down every other minute and checking dark objects in the sand. I felt like the guy who combs the fringe on his rug. By 5 o’clock Sunday evening, Larry and Laura were worn out and wanted to quit early. 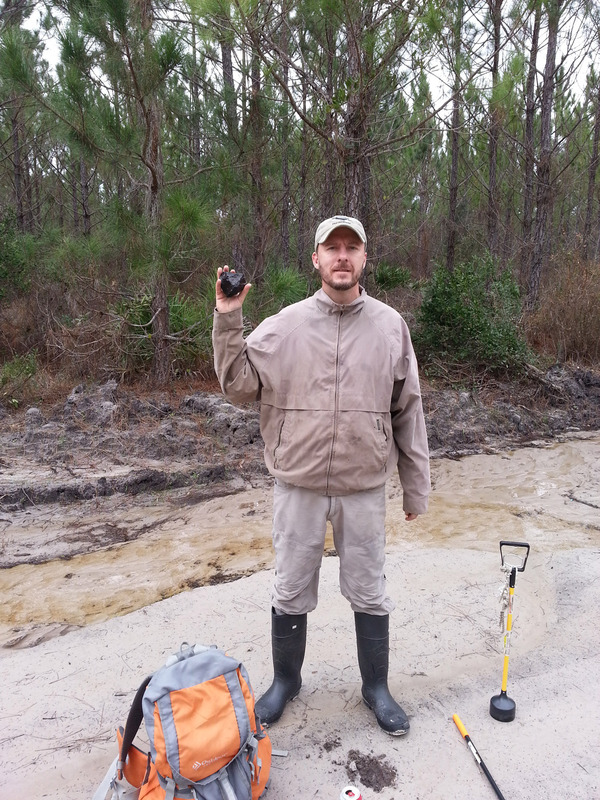 It was my last day there and I didn’t want to stop early, while remote, I still hand a chance to find another meteorite. I suggested we drive toward the center of the radar return, and hunt for another hour until dark. Larry dropped us off on the main sand road and continued down a quarter mile with his Aunt. We planned to have him pick us up at the same spot an hour later. The three of us hunted around the road, finding nothing and then worked our way back to where Larry dropped us off. I felt tired but satisfied. It was a great trip and I had accomplished what I set out to. As I reflected and thought about my find accepting it would be my one and only, I looked down into an old mud puddle. The mud was dry on top and cracked like the ground in a dry lake bed. One of the cracks looked odd to me, so I poked it with my finger. Expecting it to be soft to the touch, when I realized it was hard, I got excited. There was a rock here. I pulled it out and immediately felt the weight. 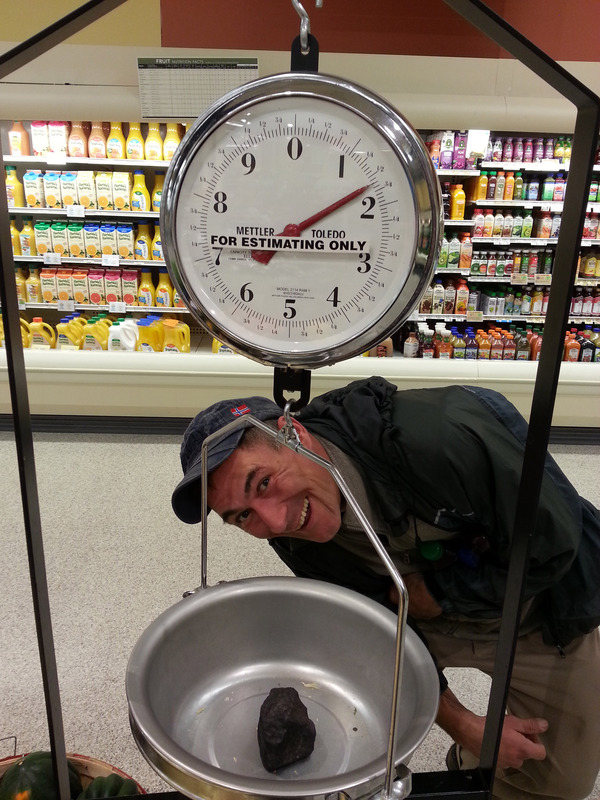 It was much heavier than a normal rock its size. I wiped away the mud and started to see smooth divots throughout the stone. 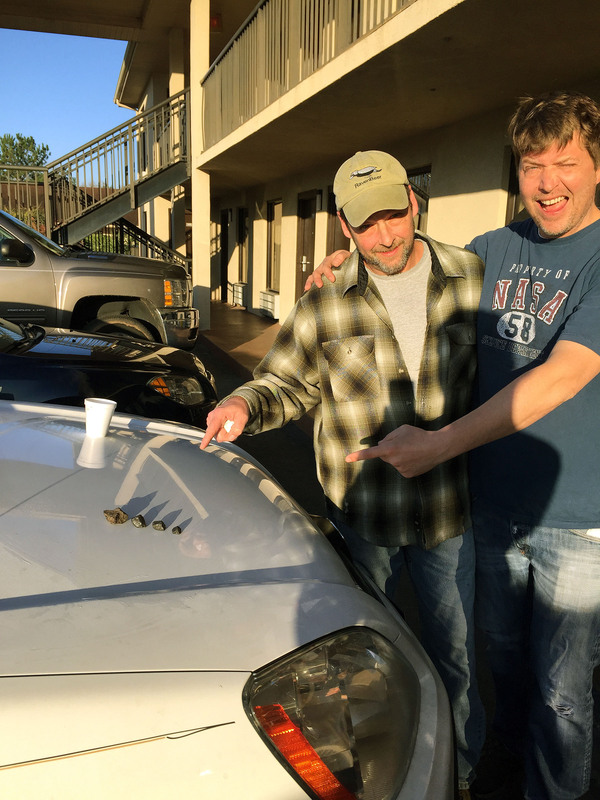 I shouted out to Brendan and Josh, “I think I got another one.” They ran over and inspected themselves, agreeing. I still wasn’t sure, the color was off, but it was hard to tell with all the mud. I borrowed a loupe from Brendan and once I looked at it through the magnifying glass I knew it was a meteorite. The rock had a fantastic crust that was oozing rust. I worked my way down the road to show Larry and confirm the find. I still had a little bit of doubt, it might not be a meteorite. Before I gave it to him to inspect, I said firmly, “Don’t throw it away! It’s covered with mud and hard to tell. You need to use the loupe”. Suspect at first, Larry inspected it with the magnifying glass and agreed. This was another meteorite, the 4th and biggest so far at 42 grams. What a great way to end the day and the trip. The next morning, Larry mailed his stone to Alan Rubin at UCLA. Alan will cut the stone, analyze it and determine its classification. We should get a report in another week. I started my drive back home alone. Brendan didn’t want to leave without a meteorite. He stayed behind with Larry, Laura, Josh and several of Larry’s family members. I wished them luck but knew they would have a hard time in the days to come. The day after I got home I got a text from Brendan. Josh’s truck got stuck in the mud on Sand Hill Road. It took them two days two get the truck out of the mud. The rest of the week for them was tough. I kept wondering when Brendan would give it up and come home. The Sunday morning a week after I got home, I got a text from Brendan and Josh. They had found a stone, a big one. 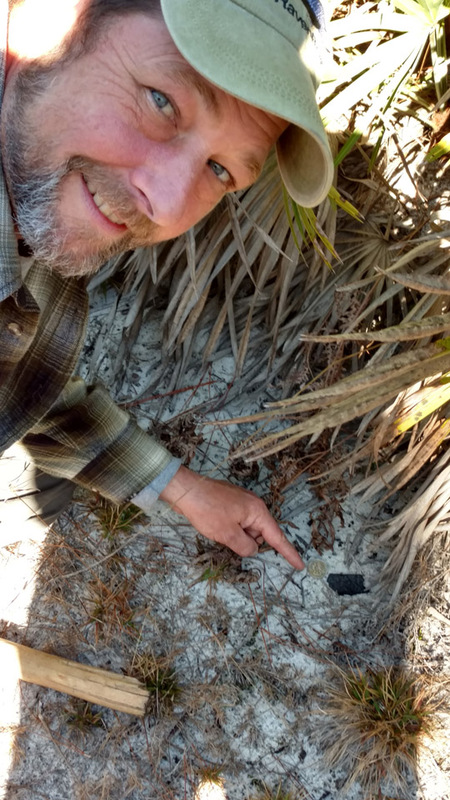 800 Gram Find in-situ – It was almost burried! Wow. Over three miles away from my 42 gram find, they found a 800 gram stone almost completely buried in the sand. Amazing. They continued to hunt for another four days with no finds. I would have called it quits after my first trip if not for the new big find. Larry was still at it with a friend and his aunt and uncle. I had to give it one more shot over a long weekend. I was in the field by friday morning and we spent two days hunting with five people total. About mid day today, Larry made another find in the woods. An almost 80 gram stone. I’ve got one more day in this strewnfield and then back home tonight. No matter what happens on my last day of hunting, this was a miraculous discovery with 6 stones and almost 1,000 grams recovered. 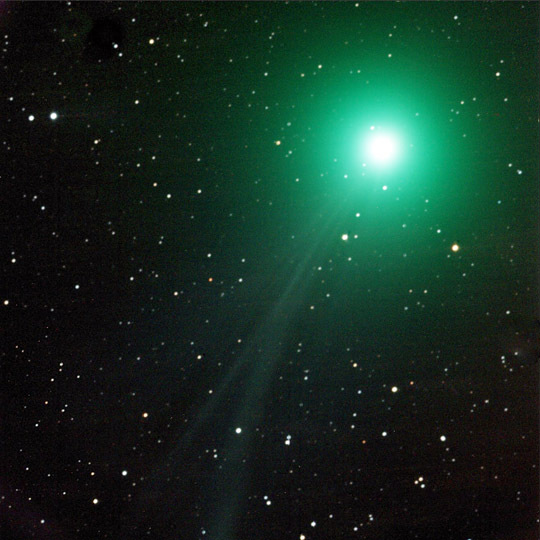 Here’s a cosmic gift delivered just in time for Christmas, Comet C/2014 Q2 Lovejoy, discovered this past August by accomplished amateur astronomer Terry Lovejoy using only an eight inch backyard telescope. The comet became viewable to observers in the Northern Hemisphere the week before Christmas and can almost be seen with the naked eye. The comet will continue to brighten over the next few weeks and should reach peak magnitude in mid January. While I have been mourning the passing of Comet ISON I take solace in the fact that there is another great comet that can be seen and imaged right now. 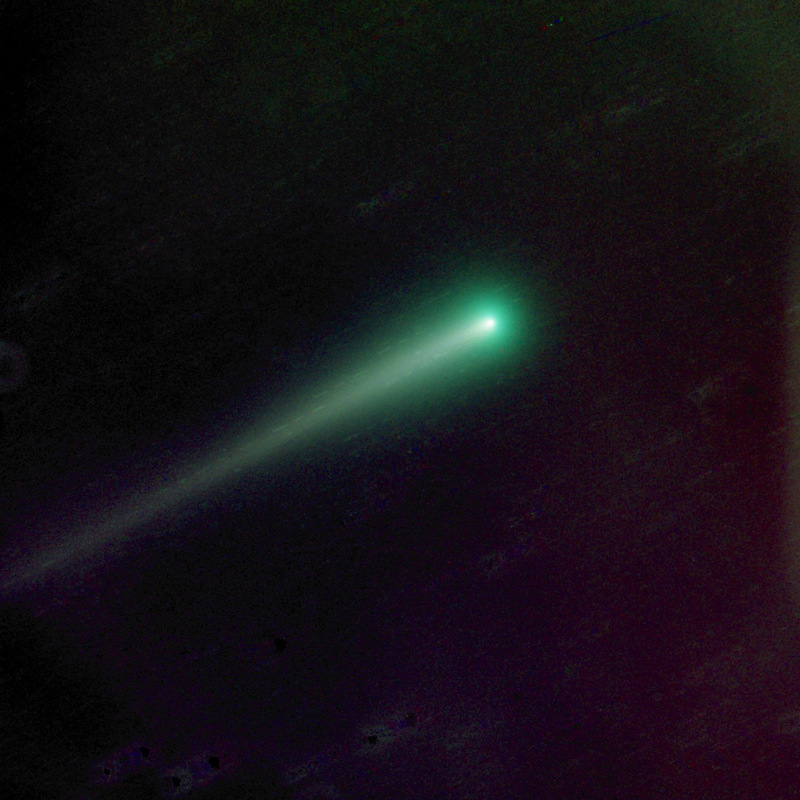 Here’s a photo of Comet 2013 R1 Lovejoy, a new comet discovered earlier this year. 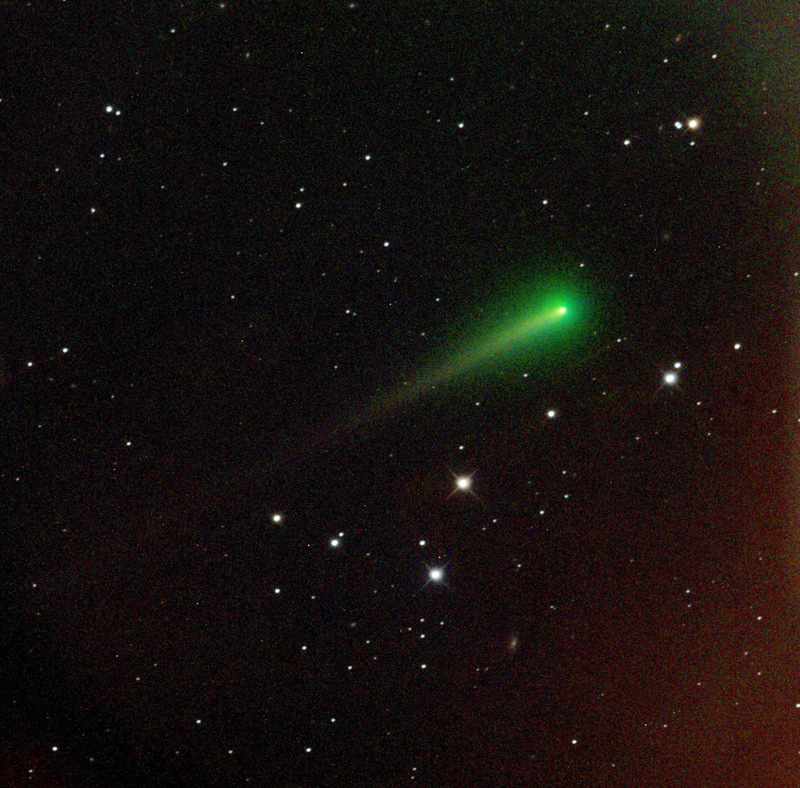 It looks like the comet has started producing a new tail. Contrary to the initial reports that suggested ISON died a fiery death as it plunged into the sun, ‘something’ emerged from the sun later than planned. A dust trail without a nucleus was the first suggestion. Now it appears the dust cloud is starting to get brighter. 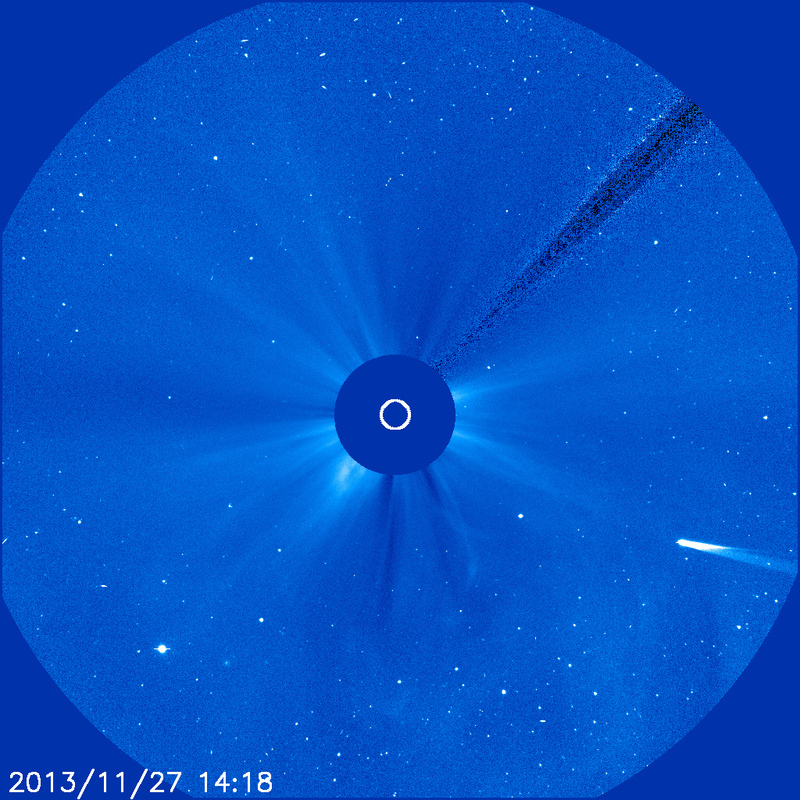 Check out this animation from the LASCO space telescope showing ISON go around the sun. 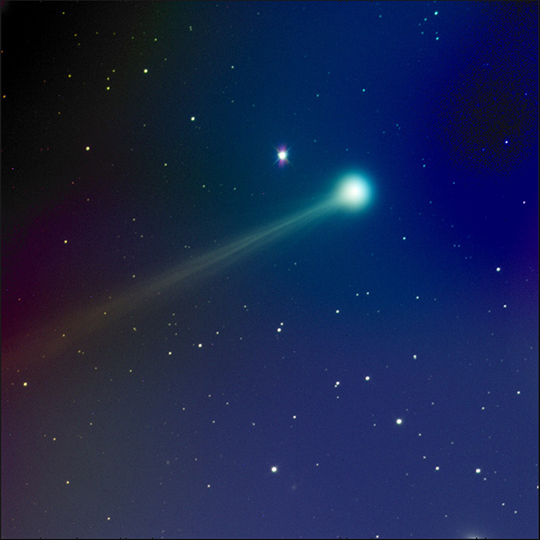 Here are the frames used to make this animation of comet ISON. Here’s a photo from NASA’s SOHO spacecraft. Comet ISON just entered its field of view today. The space ship should be able to watch the show as the comet goes around the sun tomorrow! 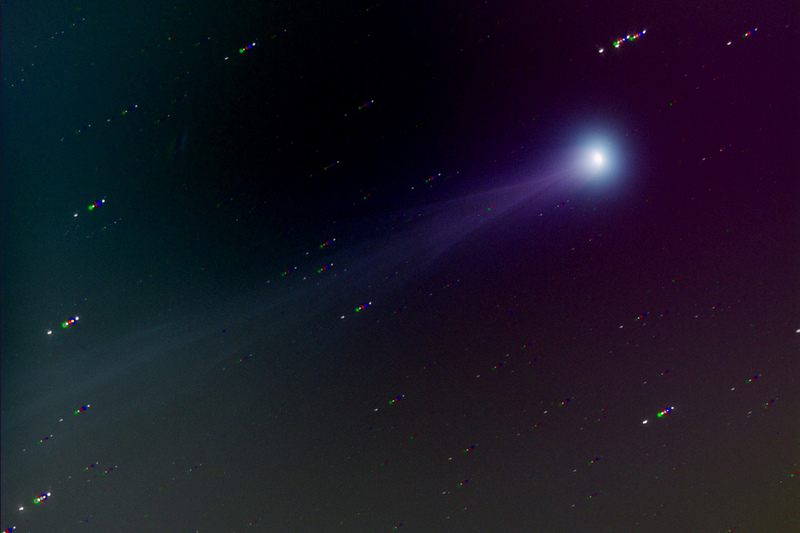 Here’s a reprocessed version of my comet ISON photo from Nov 15th, right around the time of the outburst. 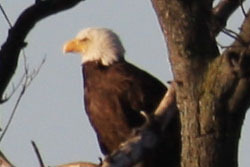 This image uses the Luminance channel. It was a bit of work to stack it all together, and it changes the color, increases the resolution but also dims some of the finer features. I think I like the original one better, but since the clouds on both coasts have kept me from imaging I figured I’d work with the data I already collected. This photo is the result of 3×60 seconds exposures, one each through red, green and blue filters and 3×60 seconds of luminance or clear filter shots. 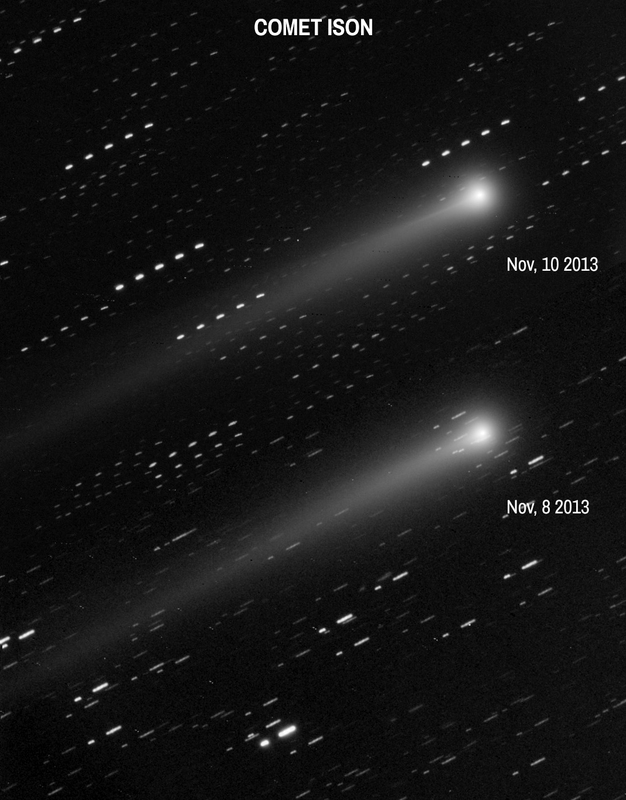 For more photos of comet ISON, check out my comet ISON images page. Due to clouds and high humidity I have not been able to observe Comet ISON the last two days. The window of opportunity to catch ISON in darkness from my California observatory, while the comet is still above the 15 degree viewing threshold, is almost over. I might have 1 or 2 days left at best. Moving forward my efforts will be focused on DSLR photography of comet ISON. For the next week or so of November, ISON will be visible right before dawn on the horizon in the south east. We will then have to take a break while the comet goes around the sun. At this point the comet will only be viewable by NASA and ESA space based telescopes, but don’t worry several of them will be pointed at ISON while it grazes the sun. At some point in December, if the comet survives passage around the sun, we will start to be able to see it again in the western sky at and after dusk. If this happens it will be a spectacular sight potentially stretching across half of the sky. 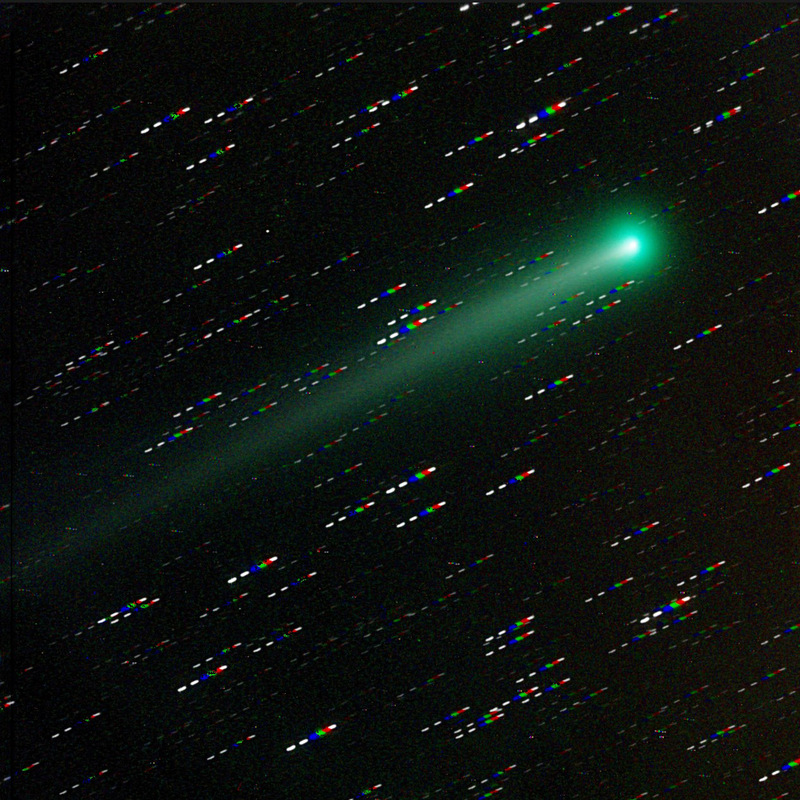 Here is some information to help you observe comet ISON in November and December 2013. These ISON sky charts were created using the program Stellarium. 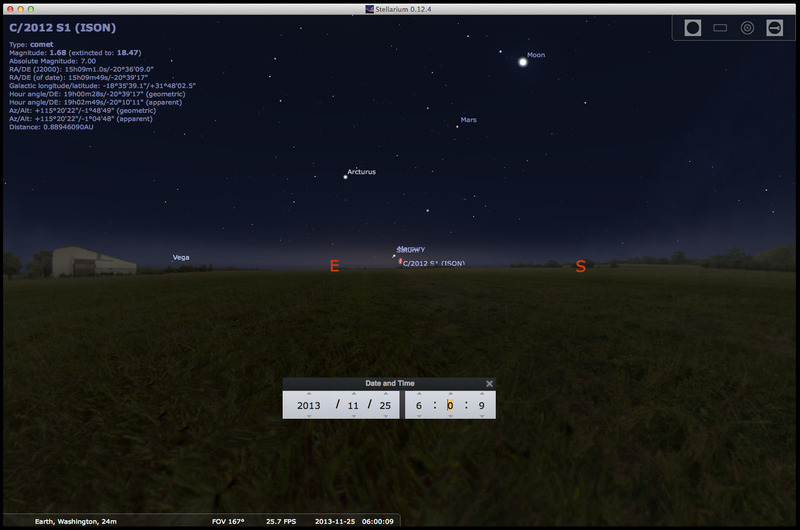 Stellarium is a free planetarium software program that you can use to model the sky and solar system at your location. 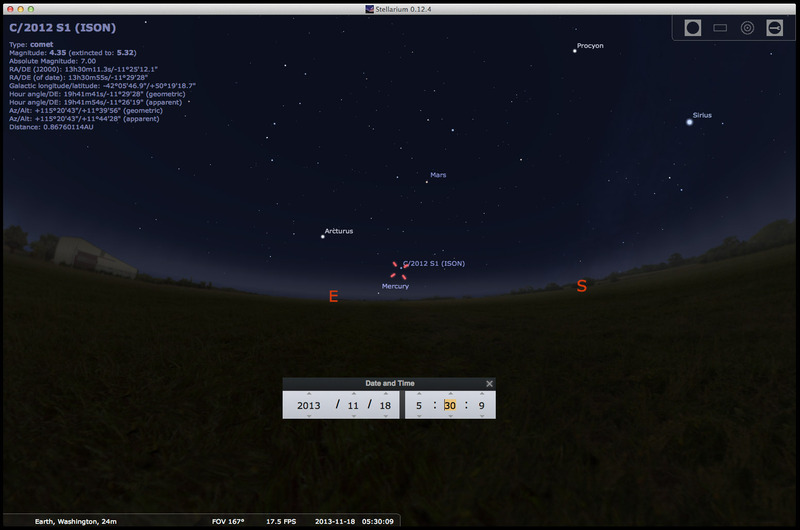 You will have to follow some special instructions to get comet ISON to show up in Stellarium. For power users, I have posted this information below. Where is Comet ISON in November 2013 and what time will Comet ISON be visible in November 2013? 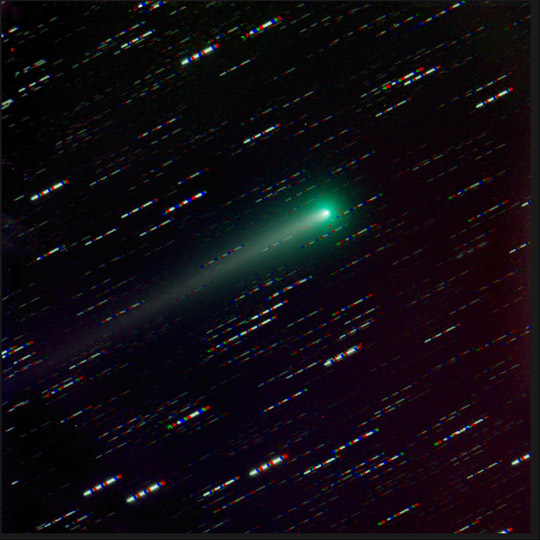 Most people interested in Comet ISON want to know where it is, what time it will be there, if they will be able to see it with their naked eye and what it will look like. Over the next week these ISON sky charts will help you find the comet while it is still visible in November. 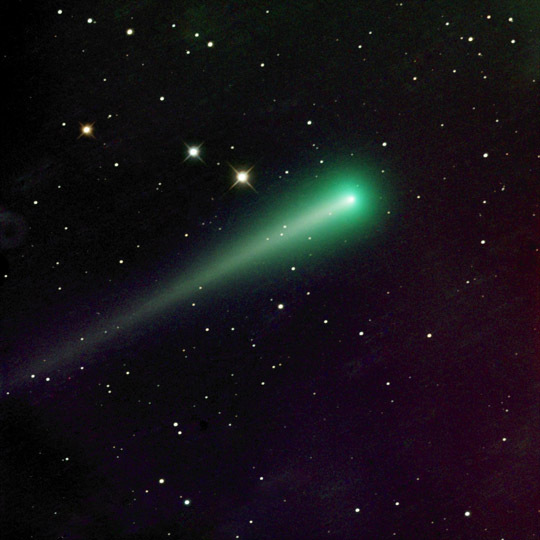 This (Nov 18-Nov 25) is the last week to watch ISON before it passes the Sun! these ISON sky charts will help you over the next 6 weeks. To find it look in the East at 5:30 AM. 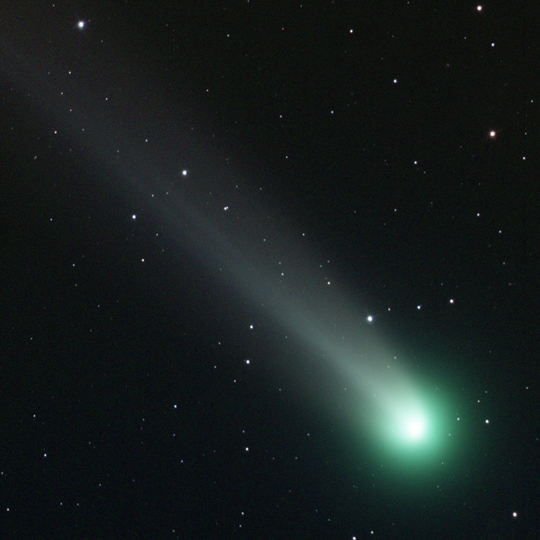 On Monday, November 18th, 2013 the comet will be visible low in the eastern sky by 5:30 am. The best viewing time for comet ISON this week will be between 5:30 – 6:00 AM. Here is a sky chart with Comet ISON for reference. By the following Monday, November 25th, 2013, we will no longer be able to see ISON because it will be rising with the Sun. At this point we will have to eagerly wait to see what happens. 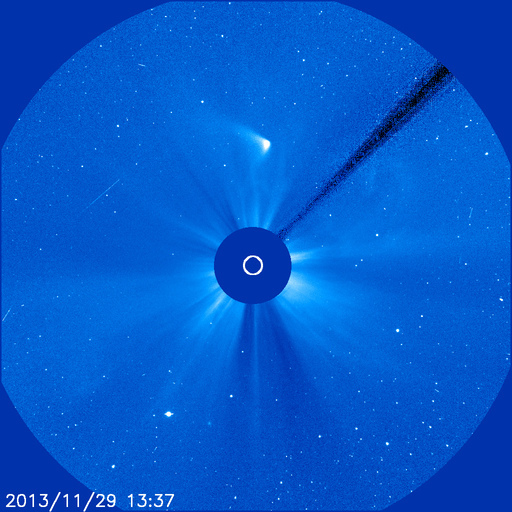 I am thankful NASA has space telescopes that will watch ISON as it orbits the Sun. 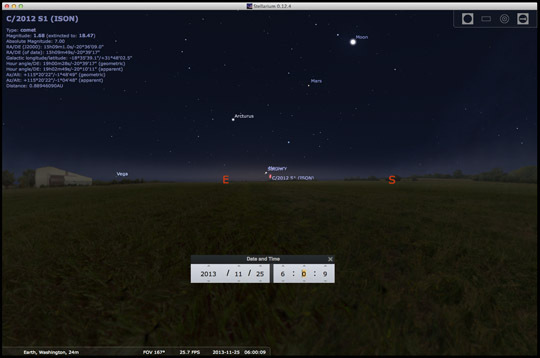 How to show Comet ISON inside Stellarium? Select ‘Comets’ Radio Button, then ‘MPC’s list of observable comets’, then press ‘Get Orbital Elements’ Button. In the add objects search box enter ‘C/2012 S1 (ISON)’, select the check box and press the ‘Add Objects’ Button. Now you will be able to search for ISON, see where it is inside stellarium for your location, and change the viewing data and time. This is certainly the BEST way to know how to find ISON in the sky. Good luck and happy observing! Capturing ISON was challenging again this morning, but I was able to sneak out one short exposure (1 x 60 seconds x RGB) in between clouds. It looks like it has changed again since yesterday. Comet ISON – November 14th, 2013 – VERY BRIGHT! Here is an alert email from Mike Kelly about ISON brightening this morning. Yahoo Comets Mailing List, are around 6.5 to 6.0.
yet an indication of disruption. are taken the 12th and 14th of November. I was eager to look at Comet ISON images this morning, but a little disappointed with the second tail as it actually seems fainter in today’s pictures than it did yesterday. I think this is most likely due to differences in seeing conditions between the two days (maybe a little hazier for me today). Either way here are my latest ISON photos from this morning. 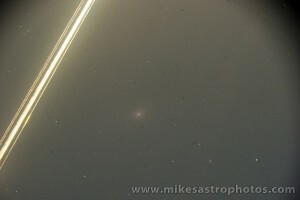 Here is a page with all of my Comet ISON photos. Here is just the luminance channel. You can see the second tail a little more clearly in the black and white photo. Image details: 15 minute luminance channel (5×180) and 3 minute RGB. (1×180) at 3×3 binning. 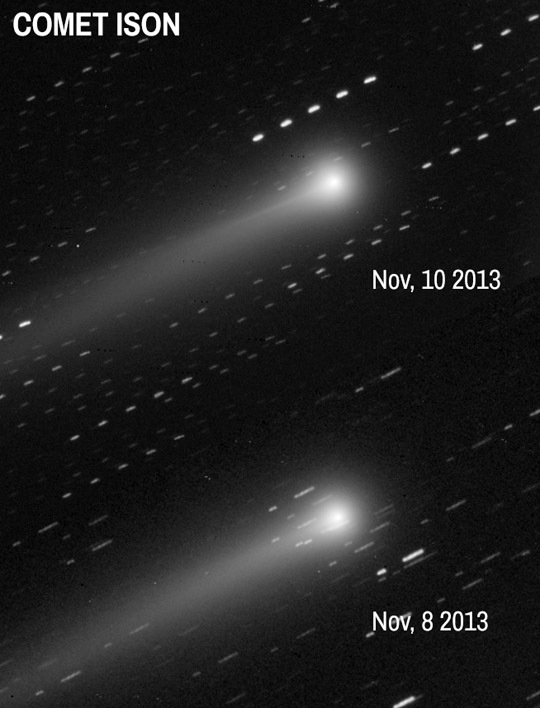 For more Comet ISON photos going back to September 2013 visit my Comet ISON Photo page. 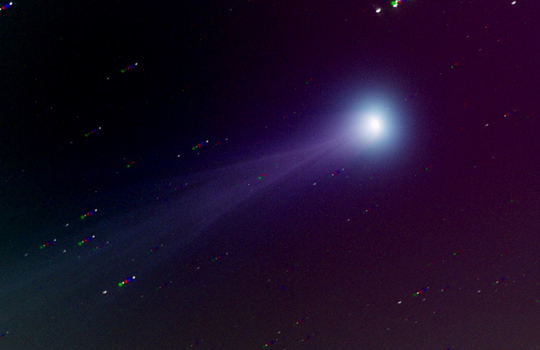 Comet ISON – New Tail Feature? I noticed a new prominent feature in the tail of Comet ISON while imaging it this morning. It looks like a thin jet towards the top. Below is a comparison of today’s image with the last one I took just two days ago on November 8th. You can see the trail is just barely visible on the 8th. Here is an inverted version of the same picture. Its a little easier to see the features in the inverted picture. Here’s the color version of just the comet this morning. And here is the color stacked with trailing stars. (I will come back another morning to image the star field and complete the final picture). These images are the result of 5×3 minute exposures of Red, Green, Blue and Luminance at 3×3 binning on the morning of November 10th, 2013. If you have noticed this feature already, please email me links to your most recent images. I’d love to compare. 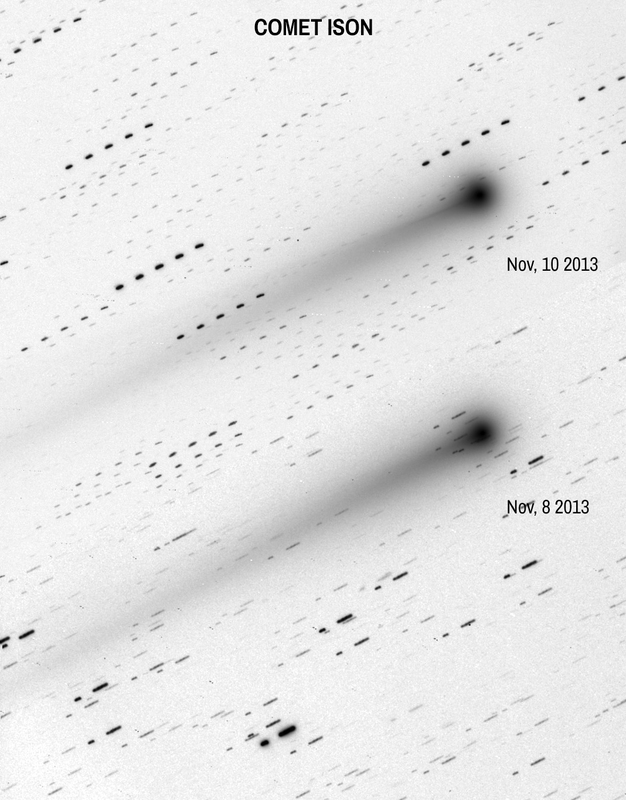 I’ve been diligently imaging Comet ISON each morning possible since mid September. It is changing nearly everyday, getting bigger brighter and a longer. 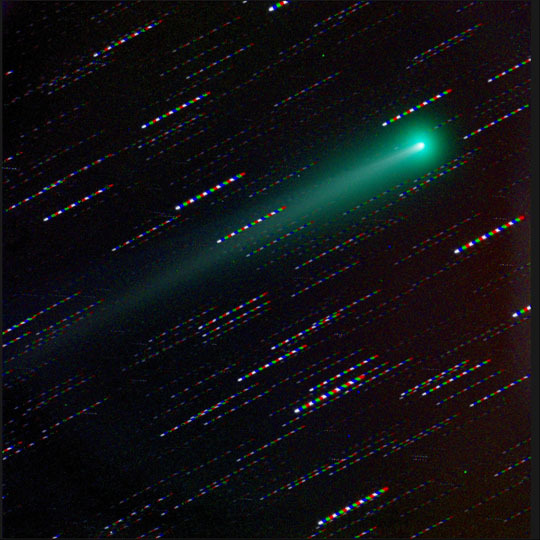 Comets in general are challenging to image and each one has its own little quirks: how bright it is, how fast its moving, how much dark time there is available to image. 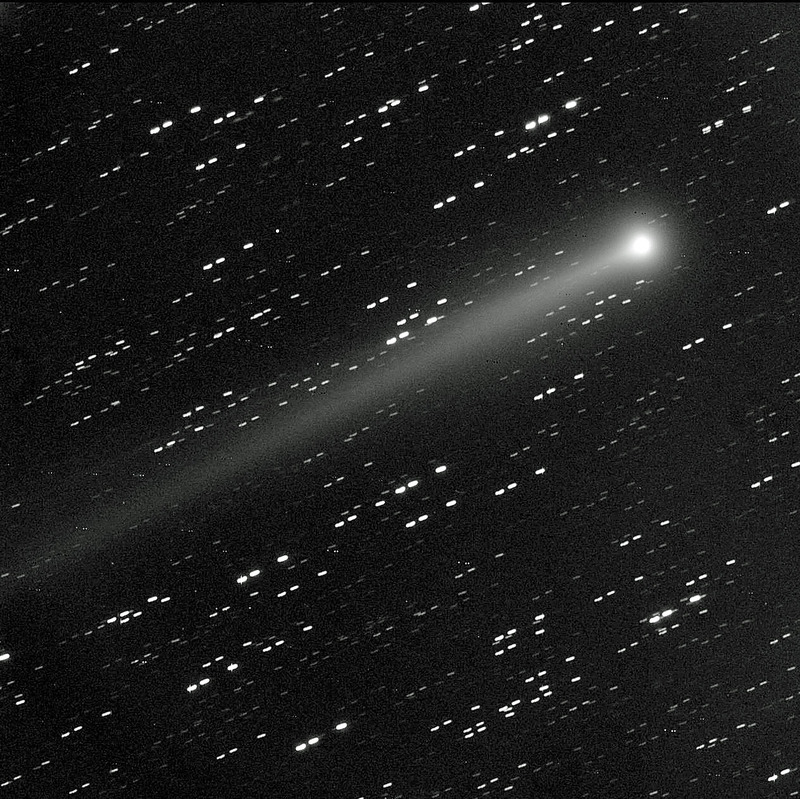 For ISON we have only had about 1 hour each morning to image which doesn’t leave a lot of time for a long exposure. On a whim, I decided to combine 3 days worth of data together to get a better image. 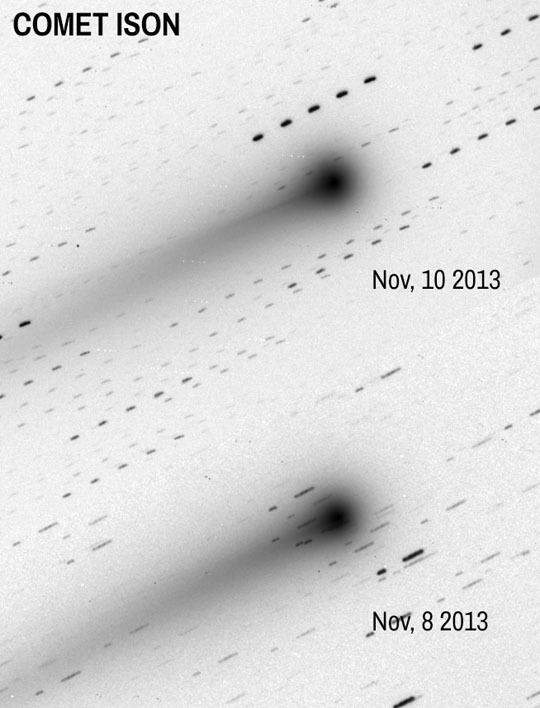 Here is a picture of Comet ISON that was taken over a three day period, November 2nd, 3rd and 8th. 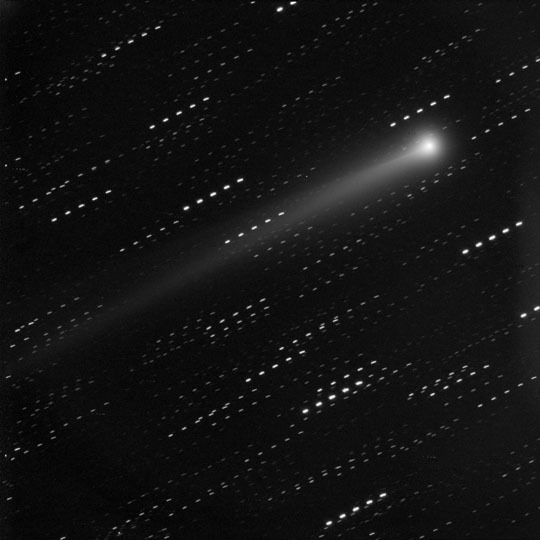 Image processing is a big part of the challenge with getting a nice comet image. There are several different ways to process and look at the picture. The easiest thing to do is to just stack on the comet and have the stars trail like this image below. While you can get a good view of the comet, the background doesn’t look so nice. We see trails of red, green, blue and white because the telescope is tracking the comet with each exposure. When we combine the image centering on the comet, the stars don’t line up in the same place, leaving us with streaked multi-colored stars. Its a time consuming process, but what you need to do is reject all of the stars out of the pictures while stacking the RGBL frames. This will give you an image of just the comet with no stars. Once you have the comet isolated, you then stack just the stars or re-image the star background on another day (when the comet isn’t there). Then merge the 2 images (the comet only and the starfield) using the photoshop overlay feature and you will have a nice combination of a clear starfield and a well defined comet. Here’s another photo of ISON from October 27th, 2013.